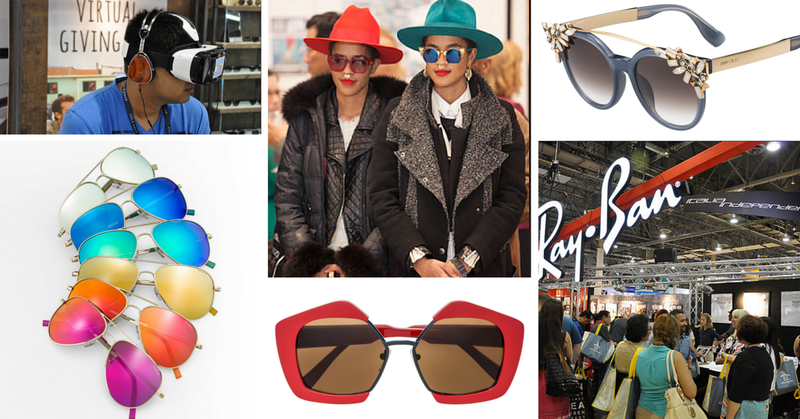 The latest eyewear fashion and trends are set to be unveiled at the world’s leading eyewear industry event, International Vision Expo & Conference in New York City (held at the Javits Center April 14th-17th, 2016). Co-owned by The Vision Council and Reed Exhibitions, the 30th annual International Vision Expo & Conference will be bigger than ever and cover a broad spectrum of the eyecare industry; showcasing the latest advances in eyewear fashion, design, technology, medical care, education and business. 76.2% of the U.S. adult population wore any form of vision correction – a growth of 2.1% compared to 2014. There was a 6.3% rise in the number of U.S. adults wearing prescription sunglasses (11.7% of the adult population, compared to 11.2% in 2014) and a 3.4% rise in the number of U.S. adults wearing contact lenses (16.4% of the adult population, compared to 16.0% in 2014. Industry revenue in the U.S. increased for all types of vision correction, including frames, lenses, contact lenses, plano sunglasses, OTC readers, eye exams and refractive surgery, with the highest rise being the sales of lenses ($12,622.3 million in 2015, an increase of 7.9% on 2014) and contact lenses ($4,664.2 in 2015, an increase of 5.4% on 2014). There was a 3% rise in the number of eye exams in the U.S. (113.9M) compared to 2014 (110.6M). Nine members of the prestigious Eyewear Designers of the Council of Fashion Designers of America (edCFDA) will present new eyewear designs during the first ever Eyewear Showcase (April 15, 3:30-5:00pm). Galleria Lounge. Marchon Eyewear will preview its Nike Vision Spring 2016 collection, including the latest in performance eyewear with its enhanced Nike Running Collection, which uses new materials and vision technology to create high-performance eyewear that stays stable during movement, grips when the athlete sweats and conforms to the shape of his or her face for maximum comfort. New brand launches from Marchon Eyewear will include Spring/Summer 2016 eyewear collections for Etro, a brand historically synonymous with Italian-made elegance, demonstrating passion for prints and craftsmanship; Marni and MCM (Modern Creation Munich), presenting a new eyewear collection that combines classic elements of timeless luxury with a very contemporary, innovative design. Booths 4534, 4546, 4575 and 4652. Safilo Group will showcase Givenchy's new Spring/Summer 2016 eyewear collection, deliberately unisex and conveying Givenchy’s identity through iconic detailing: stylized stars on the front, small metal teardrops on the temple tips, golden studs all over the profiles and staples fusing into hinges establish the uniqueness of the new designs; FENDI's Spring/Summer 2016 Sunglasses Collection, a new interpretation of the “frame within a frame” concept, creating stunning contrasts between the round lenses and the cat-eye shape, as well as its new EyeShine Collection which reflects the Roman Maison’s highest savoir-faire and creativity featuring a futuristic design, enhanced by a magnetic all-over mirrored effect of the frame; Gucci’s new sunglasses and optical frames presented on the women’s and men’s Spring/Summer 2016 runways; Jimmy Choo’s new eyewear collection for Spring Summer 2016, featuring jeweled ornamentation, exotic leather inlays and bands of glitter that harmonize with the brand’s accessories collections and Dior’s new summer 2016 DIORSPLIT collection, offering a graphic reinterpretation of a classic shape. Other launches include an exclusive eyewear collection designed by Marcel Wanders, as well as the new Polaroid Twist collection from Polaroid, a unisex polarized sunglasses collection for adults and kids. Booth 3548. Luxottica will unveil Ray-Ban’s Spring Summer collection, including the new Clubround sun and optical frames - rounded phantos shapes featuring Clubmaster-inspired acetate brows, coined metal rims and bridges; and showcase Oakley Prizm technology’s new EVZero range for the first time, the lightest performance sunglasses they’ve ever created. Booth 4152. Victoria Beckham Limited will attend for the first time to launch its new eyewear for the U.S. market - designed and developed in-house in London and produced independently by hand in Italy. Booth U6218. Inspecs will debut its new sunglasses and ophthalmic frames created in collaboration with the legendary musician Carlos Santana, showcasing its “Carlos by Carlos Santana” and “Santana by Carlos Santana” collections. Booth 5334. Acuity Pro will showcase its latest version of VisionScience Software, a professional computerized acuity testing software suite that was used by NASA to gather data on crew members' visual health during and after long-duration space station mission. Crew members' bodies change in a variety of ways during space flight, and some experience impaired vision. Booth MS7010. Liberty Sport will launch Helmet Spex, designed to be the best fitting frame for sports that require a helmet. It will also showcase its Switch Magnetic Interchange technology, the world's first magnetic interchange sun lens system which uses high-energy magnets embedded in the lens and frame to let users quickly swap in the lens required for changing activities and light. It has just been announced that two styles of Switch Magnetic Interchange technology have passed the rigorous testing required by NASA and in 2016 will be launching into space as the eyewear solution for their astronauts. Booth 4420. Aspex will showcase BMW Eyewear Collection’s new “M Series” line, embodying the spirit of the luxury car brand. Booth 3920.
iGreen Eyewear will launch its new custom collection, requiring less water and less electrical energy to produce compared to other frames. It’s incredibly lighter-weight and available in 350 new colours. Booth G5964. Signet Armorlite will launch KODAK Total Blue Lenses, a hybrid solution to harmful high-energy light. The anti-reflective/lens combination protects against direct UV rays and HEV blue light from natural and artificial sources, while allowing essential low-energy blue light to reach the eye for good color vision and to regulate the sleep cycle. Booth LP7616. Carl Zeiss will highlight its new DriveSafe lenses, designed to meet the vision needs of people who want to feel safer driving with their everyday lenses, by featuring a Formula One car and game simulator and DriveSafe Experience room on its booth. Booth LP7608. Retired NBA star, Shaquille O’Neal, will be present to launch his eyewear collection in partnership with Zylowear (April 15th, 12pm-3pm). Booth 4752. An array of fascinating education sessions, including a presentation on Wearables...Where It's at, Where It's Going and Impact on Vision led by Jerome Legerton (Saturday April 16th 2016, 9:45am – 11:45am, location 1B04), who will reflect on the emerging eye-wear borne micro-display technology trend, forecast to be a multi-billion dollar industry by 2020. Aaron Tarbett will host a talk entitled Vision and Eye Care in War: The Conflicts in Iraq and Afghanistan (Saturday April 16th, 2:45pm – 4:45pm, location 1A04), covering ocular and vision related injuries sustained on these battlefields and their management; as well as touch on battlefield adaptations that enhanced eye and vision care in theater. Tarbett will also share his fascinating experience being the White House optometrist (2006-2015) during his talk entitled Optometry at the White House (Saturday April 16th, 5:00pm – 6:00pm, location 1A28). Media may attend and cover any education session with a valid press pass, but no recording/videotaping is permitted without authorization. The International Vision Expo & Conference takes place in New York (April 14-17th, 2016) and Las Vegas (September 14th-17th, 2016). Proceeds are used by The Vision Council to educate consumers about the importance of vision care through the Think About Your Eyes program. Buyers, exhibitors and attendees help to build a stronger vision industry by supporting International Vision Expo. For further information, visit www.VisionExpoEast.com. Thank you for taking the time to read our eyewear industry blog post. We hope that you have found this news to be informative. If you have comments or questions, please add your thoughts in the discussion area below.